I'm pleased to present some much needed current work, as opposed to catching up and reposting miniatures painted for the ‘Fourth Analogue Hobbies Painting Challenge’. Four Victorian Bobbies* each armed with an electro truncheon, which I imagine to be akin to a cattle prod – something one should certainly be wary of at all times! *for those of you who read that too quickly, my abject apologies, you must be very disappointed! This then is my next, tentative step at actually trying to complete at least one company for use with the ‘In Her Majesty’s Name’ rule set. The miniatures themselves are from 'North Star Military Figures', sculpted by Mike Owen of 'Artizan Designs' fame and are of a splendid quality. In fact every time that I actually work on one of these miniatures, I curse myself for not having started sooner. The boys in blue were hastily promoted to the head of the painting queue after seeing the work of Legatus and Terry Silverthorn, both of whom are making considerably better progress than I am with their companies and remain a constant source of inspiration to me. With regards to painting, I shamelessly copied Mr. Dallimore’s example from the very handy ‘How To’ posted in the North Star newsletter and whilst not a patch on the maestro’s work, I was relatively pleased with how they turned out. My only hiccup, and it was one entirely of my own making, was when I was affixing one of the cables that connected the electro truncheon to the power pack on the respective officer’s belt. I inadvertently snipped the wretched thing too short and there then followed much cursing and wailing until I managed to bend the poor chap’s arm far enough to allow his truncheon to be reconnected! So just the consulting detective, his sidekick and the Special Branch to go then! I have some of these also, and love them. Yours are just smashing Gov'ner! Thank you Paul, they really are a joy to work on. I am liking these very much Michael and I can see a definite Ripper Street feel. Thank you Pete, I think the sculptor must have been a fan too! Very nice, modest colors. Lots of character on the figures too. Thank you, mostly down to the sculpts I think. Great Michael , i love it great diorama an paint . Splendid Peelers sir. 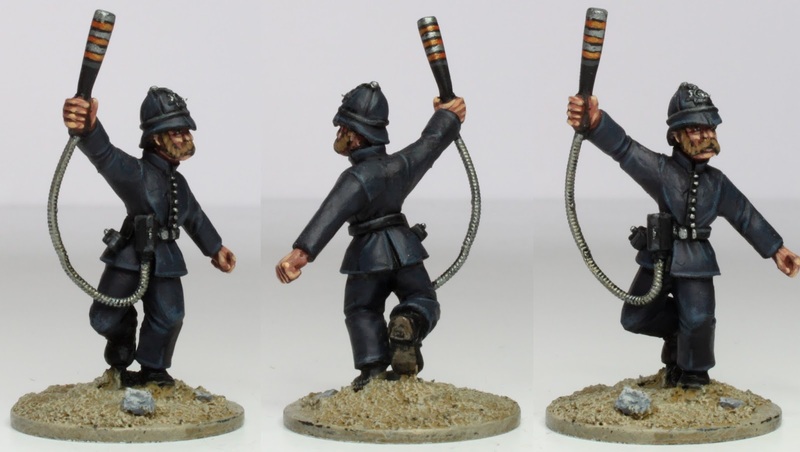 As for the electro-truncheons, I'm sure Corporal Jones would be saying "They don't like it up 'em!" It would certainly make your eyes water! Thank you Phil, I was worried that the blue might be too dark, but it seemed to work out alright in the end. That is really kind of you Rodger. Nice Rozers! You certainly do produce some nice figures. Thank you Clint, I just need to game with a few more of them! Great work Michael, you have done a great job on these figures. Thank you my good man, they really were a delight to work on. Beautiful work on the peelers though. I knew there would be one! ;) Thank you nonetheless Pat. Thank you very much, the base is recycled from an earlier piece of work done as part of the recent painting challenge. Pukka. You just need a 'Phantom Raspberry Blower' of ole London Town, Guv'nor. Now there's an idea, thank you. Great work as always Micheal, though I must admit what caught my eye, were the tea-chests! What lovely background clutter! Thank you Scott, good old Ainsty Castings to the rescue. Thanks, I'll have to check that out! "Allo, allo, allo. What'sgoin' on 'ere then?" "Only some bloody fine painting, officer." I shall endeavour to do my damndest, thank you. When you cut the cable wrong did you exclaim "you're nicked" ? I love the Victorian era, and these are great figures. Oh very good Sir, I wish I had thought of that. I must admit the air was blue when I realised what I had done, but we got there in the end. Honest Guv we wuz just on our way back from the local…. I confess that I was among those who misread your title.. I think I'm too used to Loki's stuff. If your blog name had registered as strongly as your posting title, I would have known that the content was SFW. Wonderful looking work on the electro-peelers. I must say the white gloves and magnificent ginger beard really make the sergeant stand out while still making seem a part of the unit. Now I'd like to take credit for that, but it was all the idea of Mr. Dallimore and features on the painting guide. That said, I was pleased with how I executed it. Thank you so much and welcome aboard Sir. Thank you Francis, I was really pleased with how they came out in the end. Impressively done! You certainly put the period in the best light. As always your brushwork is superb. They look nice in that setting. Thank you Anne, I was certainly keen to recycle 'Whitechapel' after the challenge. Thank you black is not one of my favourite colours to work with, these were actually a really dark blue. Ahhh I see! It kinda explains how the color still looks vibrant. But still extremely well painted. I love em. After slightly misreading the post title, :-/ I was actually pleasantly surprised... wonderful job on these Michael! Greate terrain backdrop to ! Lovely work sir. The truncheons look fab with the different metals interlinking. Out of interest what colours did you use for the uniforms? I have a good quantity of them to paint up myself. Thank you so much Simon. The colours were a mix of Prussian Blue with Black - really quite dark to begin with and slowly lightened. Nice paint jobs Michael. I wonder about the bases though..I would have been tempted for something a bit more urban. Thanks Dave, you're not wrong about the bases, but in the end I decided to go for continuity with my other characters. Excellent work. I can testify to the efficacy of cattle prods. Years ago I worked for Boots, when they had farms departments, and being new was shown the various implements ( flower dyes, pig tattoo gadgets, lamb castrater pliers, etc) amongst which was a cattle prod. I was given a demonstration by being told to put my hand on the counter whereby my 'mentor' poked my hand with the prod prongs, I couldn't use the arm for half an hour!! No Health and safety or risk assesments in those days. Oh my word! That sounds like a chamber of horrors Joppy, thank you! These make an arresting sight Michael and the backdrop sets the scene wonderfully. Very good Pat and thank you. I'm please I found a use for 'Whitechapel'. Having been on the wrong end of an active cattle prod, I can assure your readers that it is a decidedly unpleasant experience. I should suggest swift compliance with the dictates of these peelers, lest you learn what I know, to your own chagrin. I am sorry for your pain! Of course they only hurt if the officer has remembered to put the contraption the night before! I think you can be very pleased indeed Michael - you've hit the dark blue spot on, with a nice but subtle highlighting. They are really lovely; full of character and animation! That is really kind of you to say so, thank you. Very well done Michael! You almost make me want to purge my Bobbies of paint & start them anew! I am flying home this eve & will be posting photos of one of the games I played at Cangames using these figures for a scenario. Stay tuned! Thank you Terry and really looking forward to hearing of the game. Not only beautifully painted figures but a superbly atmospheric display base, exquisite. Thank you so much GM. you realized perfect steampunk minis! You are too kind Luca, thank you. Very nice work on the boobies, very nice indeed. That's very kind of you Bob, thank you. Excellent work on the bobbies Michael! Perfect shade of blue on the uniforms. Great job on the brickwork too. Very convincing. PS: I meant to use the proper idiom for that but I'm afraid my Victorian slang is a bit rusty. That is incredibly kind of you Ian, thank you. Is that blue? The layering is just magnifique! It certainly is blue, but the first couple of coats, I could barely distinguish it from the black undercoat! Thank you Thanos. Love the shading on those, gorgeous work on the dark tones. Thank you so much, I was thrilled with how they turned out. Great work on the uniforms! Dark colours are extremely hard to get looking right and you pretty much nailed it! Just saw the results of the horde contest. Congratulations Michael. Well done sir. Thank you Bob, absolutely chuffed to bits! The bobbies are great, Her Majesty will be pleased. I do hope so and thank you very much. Outstanding work! They really look the part. Thank you Sean and I can't believe the response myself, mind you half of them are from me of course! Outstanding work. I'm just undercoating the very same figures myself ready for a crack at IHMN. I must check out that painting guide on Northstars site. Thank you my good man and there is a plethora of information on the site, really worth a look. Love these policemen of yours.A lot of character! Thank you Michael, I think the quality of the sculpt had something to do with the success of this post though. Blinkin' marvelous paintjob (even if they are bobbies and not the other sort of arresting articles). Excellent painted figures! Great work on those black uniforms!